This past Monday, I was in lower Manhattan, walking the streets that once were home to James Lytton, a fictional character for whom I bear responsibility. I arrived at the World Trade Center site on the PATH train from Hoboken, riding up the incredibly long escalator out of the big hole in the ground, pausing just inside the cavernous opening to read a text message on my phone. As I did so, I was within a few feet of the spot where James Lytton had saved the life of fictional character Allison Goldsmith, by getting her moving. Perhaps a minute later, I paused before crossing Trinity Place at the corner of Vesey Street, and I looked to my right, finding the spot where James Lytton died, shortly after saving Allison’s life. When the tower collapsed, James was struck by a falling beam, then immediately buried under dust and small stones of debris. Of the innumerable confusing and inexplicable things that James had experienced during his schizophrenic life, this was, by far, the most shocking; one moment, he was walking fearfully through Hell, and the next moment, he opened his eyes in Heaven, embraced by love for the first time in his mortal memory and knowing. I paused to look at the row of police motor scooters parked near the corner, continued east, them turned downtown on Broadway. 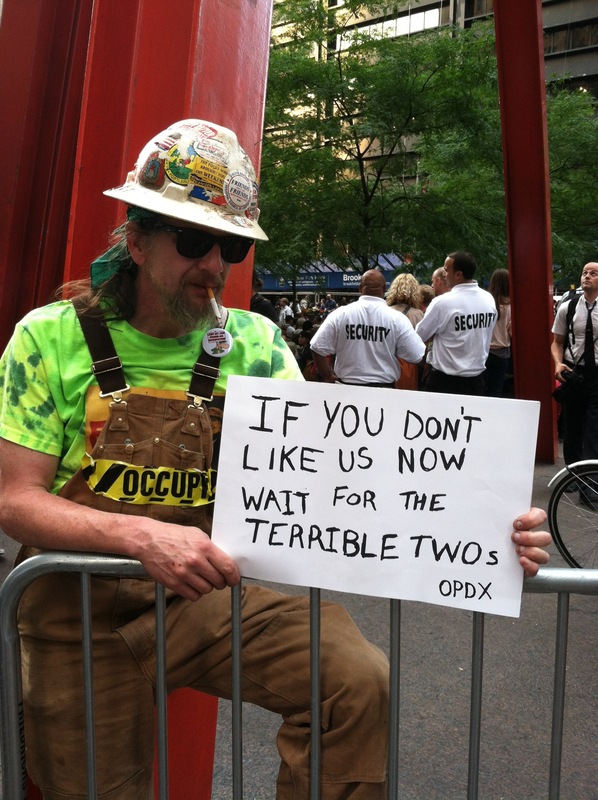 It was September 17, the first anniversary of the start of the Occupy Wall Street movement, and the birthday party was in full swing. As I neared Liberty Square, formerly known as Zuccotti Park, and formerly the site of the OWS encampment, it became hard to move on the sidewalk. The sheer number of police personnel, added to the normal weekday pedestrian traffic and the Occupiers, made the sidewalk nearly impassable. About a dozen more officers on motor scooters, and an unmarked SUV arrived and pulled into the staging area. The park was just as it had been last year; crammed with Occupiers, sympathizers, and journalists. People milled about, rested, carried signs or cameras, ate very expensive food from the street vendors just outside the park. The drum circle was in full swing. And it was all surrounded and contained by the metal barricades that the police set up everywhere. On the perimeter of Liberty Square, when most of the Occupiers have gone on a march. Note the metal barricade. I continued walking down Broadway. 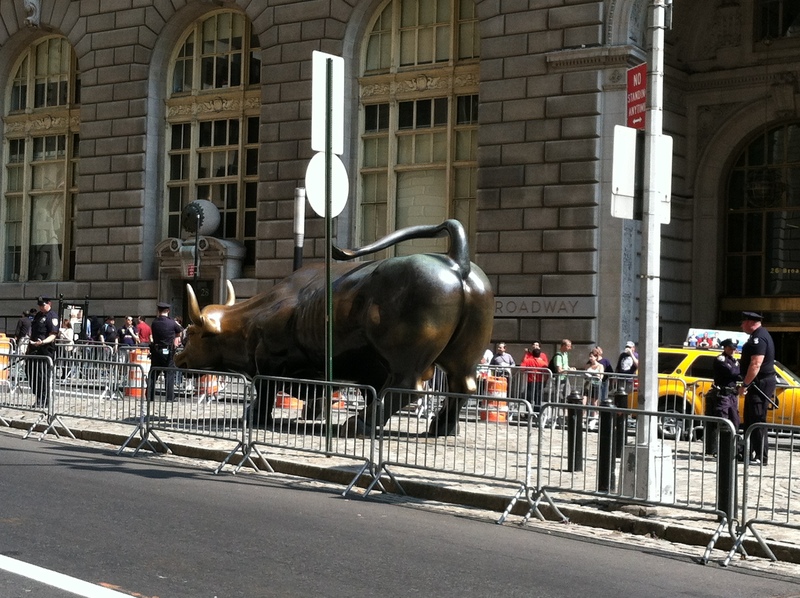 The start of Wall Street was completely closed off by a couple of dozen officers milling about behind metal barriers. A little further down Broadway, the statue of the rampaging bull was completely surrounded by barricades, defended by just four officers. A group of about a dozen protesters passed me on the sidewalk, trotting along wearing baseball uniforms for a team called the Tax Dodgers. I applauded their creativity. Starting back uptown, I admired the many police motor scooters parked along the road. (I have a thing for motor scooters.) A block before Wall Street, I turned east, hoping to be able to walk uptown on a side street — but the first cross street was blocked by about twenty officers behind barricades. I asked a sergeant if any of the north-south side streets were open, and he said he didn’t know. The next street was also closed, so I turned back toward Broadway. I paused to let the sergeant know what I had found, and he asked where I was trying to go; I told him I was just wandering, and asked how the morning had gone. He said it had been mostly peaceful. I told him that I had come to the financial district just to be a peaceful, prayerful presence. He thanked me. Back at Liberty Square, I joined the crowd inside the barricades. I enjoyed the drum circle, and mingled, trying to be peaceful and prayerful in the midst of the noise. It was when the talk turned from the 99% and the 1% to talk about the police, that it got angry and hostile. It was mostly young people of color, talking about the day to day cruelty and brutality of the police, the incessant violations of their rights and dignity, and calling for violent resistance. I tried to show that cops aren’t monsters, they are regular people caught in a system that they can’t control either, but it wasn’t heard; one young man said “No, I can’t trust the police.” But I wasn’t asking him to trust the police; I was asking him to love the people who are cops. Well, after a while I left the park, and walked a few blocks to Starbucks for my afternoon stimulant and a rest. When I got back to the park, it was already early evening, and the crowd in the enclosure had swelled with people coming from work or school. It was hard to move through the dense crowd. As I maneuvered past a Code Pink demonstrator with a sign that said Make amends, not war, I came face to face with someone who looked familiar. She was looking at me, too… Allison Goldsmith! I shook the teen’s hand. “Yes,”she said. “I mean No! We’re one hundred-percenters. We do investment banking and advocate for the poorest. We have a townhouse in the seventies and a beach house in the Hamptons. We have two great kids, a great portfolio, great lives, and we owe everything, everything, everything to a homeless crazy man with eyes as deep and kind as…as deep and kind as…Oh, I don’t know! But I do know that he never asked me what I had in the bank. The only words he ever said were, May I?” She paused thoughtfully, and her daughter gave her a quick hug, and held onto her hand. Allison continued, “That September, we were so afraid, and rightfully so. But there were no barricades, no barriers! We were all together, one hundred percent of us. Now look!” She made a gesture that took in the world beyond the barricades. “And her?” she turned Abby to face me. “Is she two-dimensional also? And them?” She gestured at the crowd around us. “Two-dimensional? As soon as you’re through using us, and we’re out of sight, we become real, even when you didn’t think it! And we suffer!” She glared at me. Then she said, “I don’t care what it takes — make him happy.